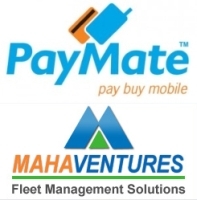 PayMate, a mobile payment company has partnered with Mahaventures, a fleet management solution provider to launch 'WayPay', India's first cashless mobile purchase management service. The service is focused on enabling cashless transactions for fleet operators across the country. The service will initially be offered in Western India. "We analysed the issues that fleet operators faced on their daily trips and decided to create a system that would help simplify payments for them without any external hardware devices. The PayMate platform is particularly suited for applications and Mahaventures is the ideal partner for rapid deployment of the service in western India," said Ajay Adiseshann, PayMate founder and managing director according to moneycontrol.com. Just recently, Ajay had invested an undisclosed amount in Mumbai-based Vserv Digital Services Pvt Ltd.
Mahaventures, established in 2005, is a fleet management solutions provider with services like Fleet Card, IOC XTRAREWARS Card, CCTV/ Remote Monitoring solutions, GPS Vehicle Tracking solution and General Insurance. Its partners include Nilson Technologies and El Labs India Pvt Ltd and now Paymate. The new service requires transporters to register their vehicles and drivers mobile number. The driver's mobile number will be registered against the respective vehicle's number and after the registration process is complete, a login ID and password will be generated. After that, the transporter is required to set purchase limits and load required funds to a prepaid account via net banking or cheque. This system can be used for fuel, purchase of tires, batteries and service centre bills. Paymate had earlier partnered with IFMR to roll out two financial services for rural users, the first service being a mobile remittance initiative and the other a micro-loan repayment initiatives and according to a study done by Informate Mobile Intelligence Pvt. Ltd., Paymate was the 5th most used app in India for mobile payment in the month of January this year.